I know you haven't heard from me in a while. That is because planning for this kitchen renovation has hijacked my life. However, the demo starts on Thursday! I am ready to stop making decisions and start doing stuff. It seems like the decisions never end and they are all inter-related, so when you make a decision about one thing it affects other things you decided on 2 months ago. We keep going around in decision circles. The cabinets and appliances have been ordered (which is probably a good thing because I can always come up with something to change.) Our current issue is the flooring. Originally, we were going to tile our kitchen and dining room. However, the remainder of the house has hardwood floors, and the dining room is very visible from the living room. Plus, my feet are always cold and the thought of cold tile in the morning makes me shiver. So, we decided to put hardwood in the kitchen...which means we have to refinish the entire house to match...which means I have to pack up the whole house and move it...which also means that maybe we should replace all of the doors and baseboards (which we were going to do but then decided against because I didn't want to have to move all of the furniture)...but maybe now it's too late to order doors. So, we decided on hardwood, but we still have to decide on the color. Our contractor said that we could look at floor stains once the floor is sanded, but I'm a little impatient. I went to Home Depot and bought some red oak boards and cans of stain. I selected Minwax "Classic Gray" (top) and "Weathered Oak" (bottom). You can see how different they are from our current floors. 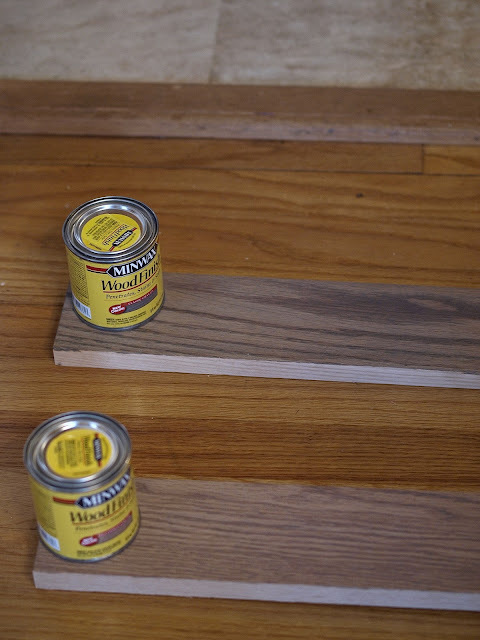 I don't like strong yellow or red undertones in wood floors, so I'm trying to "gray" them out. We may mix the two, so they don't turn out too dark. The funny thing is that when I mentioned the "gray" to my husband, he said, "I don't like gray." That stopped me in my tracks, because half of the kitchen is going to be gray. I showed him the wall color and the countertops and the floor boards and the backsplash, and he said, "That's not gray." Well, OK then. Evidently, we see color very differently. Last year at this time I was preparing for Fashion Week. This year I am living in the land of cake pops. Cake pops are a old news, but my daughter adores them and had her heart set on making them for all of her friends at school. There are many blogs out there from which you can get recipes and directions, so I am just going to give you a warning. It took us all afternoon and evening to make these. This is the dessert of one thousand steps - 1) make the cake, 2) make the icing, 3) mix the cake and icing together, 4) roll into a million little balls, 5) refrigerate balls for 2 hours, 6) melt chocolate, 7) dip the balls into chocolate, 8) cover with sprinkles, 9) beg your husband to find more styrofoam to hold up the chocolaty cake pops while they dry, 10) wipe all of the chocolate off of your children before they start touching other things in the house, 11) attempt to sweep up all of the rolly sprinkles and then resort to picking up each one with your fingers. 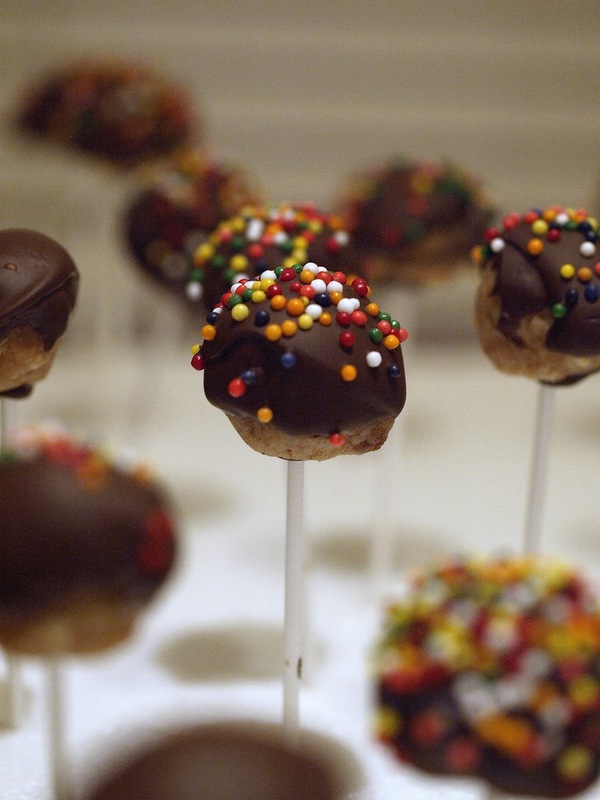 So, maybe that was only 11 steps, but it felt like the making of the cake pops would never end. I like to be a little more "make it and move on" with my desserts (or even "buy it at the store and serve it on a nice plate"). However, my daughter enjoyed every minute. My one year of not buying clothes is officially over today. How do I feel? A little sad. I already miss it. It simplified my life and made it better in so many ways. I learned to be content with what I have. Without the option to buy something new, I really appreciated what I already have. I grew to like my clothes better and never once said, "I have nothing to wear." I wore more of my clothes and stopped saving my nice things for a special occasion. It never felt like a hardship. I was actually happier getting dressed in the morning. Did it have to be a whole year? For me - yes. I needed that long to gain the right perspective. During the first few months, I was very conscious of not buying clothes. It didn't bother me, but occasionally I would think, "I wish I could buy that." After a few more months, I stopped thinking about it, and it was only when other people mentioned it that I would look forward to buying certain things (new jeans, a certain necklace). But just in the last month I noticed that clothes have became slightly less important to me. I don't really care about having anything new. I'm fine with what I have. I'm still a believer in looking nice when you leave the house, but I've noticed that the people who consistently dress well have a sort of uniform that works for them. And you don't need a lot clothes to do that. I could really wear dresses most of the time. A dress is an instant outfit. I may become known as the "wrap dress girl". These days I like anything that simplifies my life. I am determined to buy fewer items of better quality. And I am going to get rid of everything that I "might wear someday". I honestly considered not buying clothes for another year, but most of my socks have holes, my pajamas are falling apart, and my tennis shoes are wearing thin. There are some things that I need to buy just so I don't look like a hobo to my own family. However, I hope to buy more wisely and not very often.